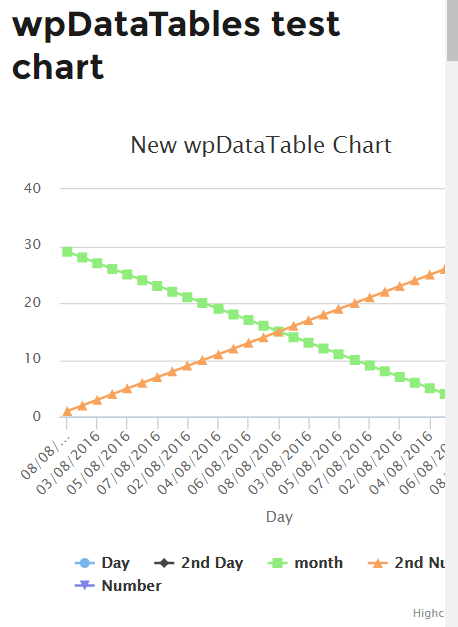 wpDataTables is a data manager plugin that lets you add charts, spreadsheets, and tables to your content without having to code. You can easily create tables manually, automatically using your own data, or by importing data from your own data sources. The plugin was reviewed here at WPMayor in 2014 (see the article wpDataTables – a Plugin that Makes Tables in WordPress Easy) but there have been a lot of features added since then. In this review we’ll take a look at some of the most important or prominent additions and we’ll get a sneak peek at what’s coming soon. Here are the features that stood out to me. For columns where you’re using the String data type you can use an HTML editor to edit the data. It works with both the front end and back end editors. This is a great way to add images, links, or any other data you want to add to your tables. 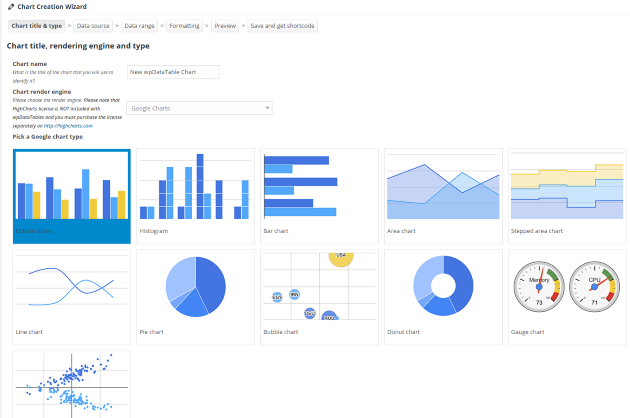 To create charts you have your choice between using Google or HighCharts render engines. Both have different types of charts and between the two you can create practically any kind of chart you need. You can choose the type of chart, data source (one of your tables), data range, and formatting. Once you’ve created the chart it generates a shortcode that you can paste into your content. I was impressed with how easily it was to create a nice chart. Charts can now be responsive. To test this I created a non-responsive chart and then went back into its settings and edited it to be responsive. With the settings not using the responsive feature the chart gets hidden when reducing the size of the window. I went back in and selected the responsive feature and the chart now reduces in size to fit the window. Inline editing allows you to edit cell values within the row. It also adds popover tools, giving you New, Edit, and Delete buttons as a popup allowing you to edit the contents of the tables per cell on the fly. Conditional formatting allows you to format the cells based on certain conditions that you choose. This is one of my most used features in Excel and I’m glad to see this as an option in wpDataTables. It even has more settings than I expected. You can set or remove color, content, or CSS class for cells, rows, or columns. You can set as many rules as you want. Formula Columns is a new column that displays the results of a formula that you create. You can use them to perform calculations on specific columns. This is helpful for adding values to show prices after tax, with shipping, for multiple items, etc. You can even have conditional formatting and CSS class for the formula row. 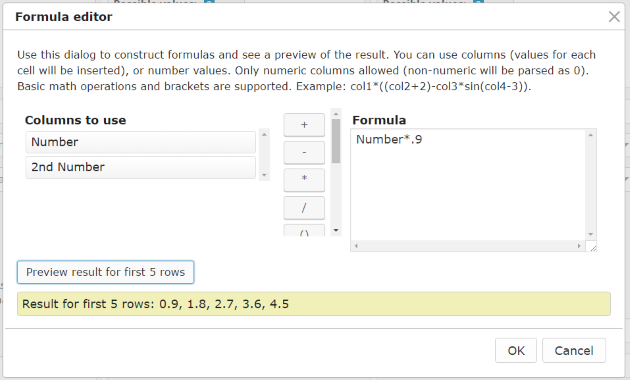 Fortunately a formula editor is included to help you build the formulas. I wanted to make another formula row and use the result from the first formula row, but it wouldn’t let me choose the first row to build formulas with. The reason for this is one formula can’t be used in another. Fortunately there is a way around this by nesting the formulas. 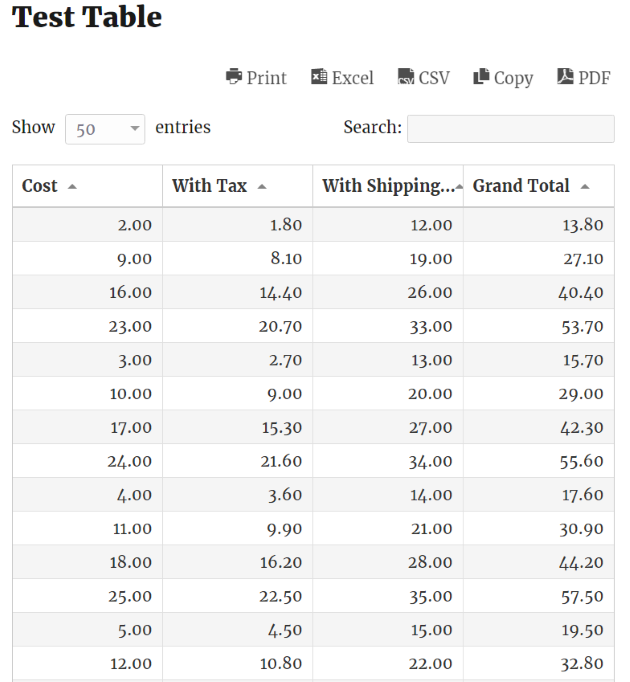 I wanted to create a row that displayed the tax, a row to display the shipping, and another for a grand total. The third row includes the same calculations as the first two. The first two simply show them as results. The results look the same regardless of where the formulas would have been, so I don’t mind having to nest the formulas. Rows with numerical values will allow you to show the sum of that row in the footer of the table if you want. This is a useful feature but I think it would be more useful if it would show the sum of formula columns. 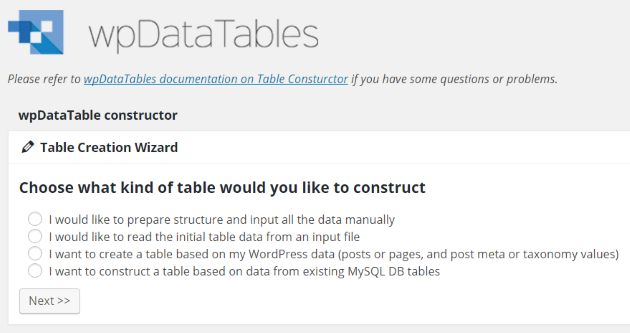 The table constructor lets you build tables. You can construct several kinds of tables with choices of data sources including to input the data manually, from an input file that you upload, from your WordPress data, or from an existing MySQL database table. Building by hand lets you name the columns, determine the type of data they contain, and assign them a default value. You can also choose how many columns there are. If you choose from WordPress data you can select from posts, pages, post meta, and taxonomy. You can also select based on conditions and grouping rules. 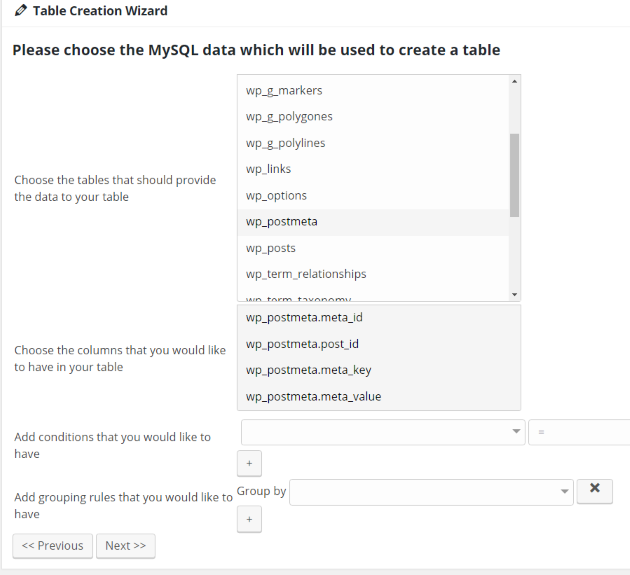 You can also set conditions and grouping rules for MySQL tables. 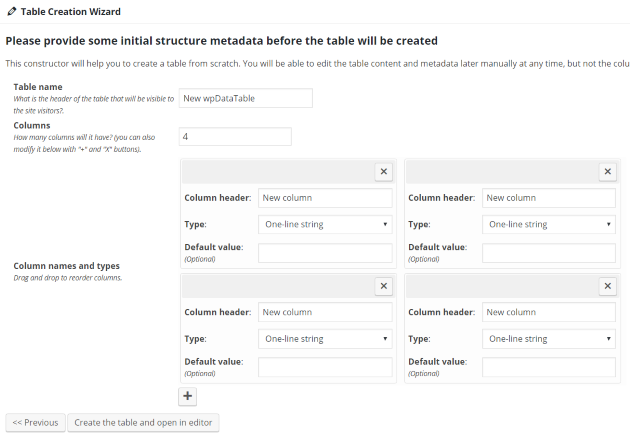 Using the table wizard to build tables from WP and MySQL data can be confusing if you’re not used to those types of data. Building the tables by hand or uploading was more intuitive and wasn’t difficult to have a table running quickly unless your table needs to have a lot of data. You can even create tables where users can edit their own data. The documentation is well written and I found it helpful to helpful in creating any kind of table. Google Spreadsheets can now be used as a data source. This is an excellent addition because Google Spreadsheets are powerful and free. You can create any kind of spreadsheet you want, and as many as you want, and store them online. 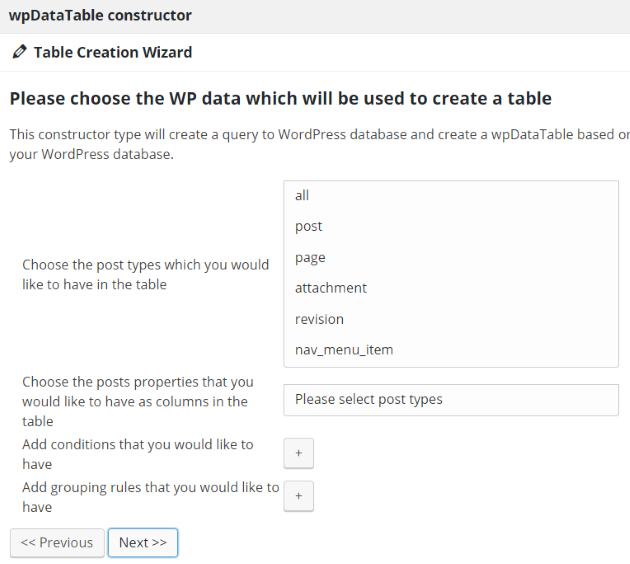 When you’re ready simply import them into your WordPress website with wpDataTables. You can even create tables that would allow users to edit their own data. Auto updates can be difficult for premium plugin developers to deal with because they have to worry about unauthorized sharing. Auto updates are handled by auto-updating based on your purchase code. It will only auto-download the same version twice but you can manually download as many times as you need. This saves you the headache of updating and reduces the risk of losing your data. wpDataTables now supports addons to add new features to the core program. 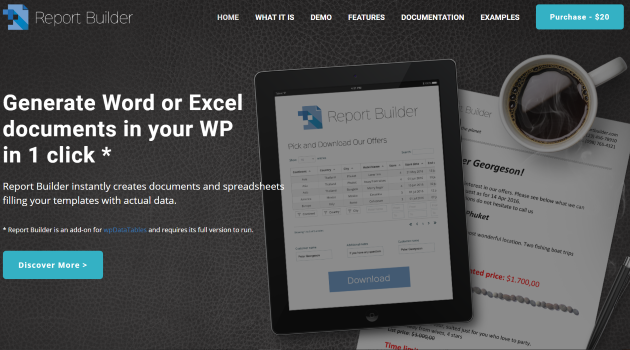 The first addon is Report Builder. This tool allows you to create Word and Excel documents using data you already have in your database. It will also generate reports individually or in bulk, calculate totals, and more. It has unlimited front-end inputs and you can even style the elements using CSS. This premium addon costs $20. The Excel-like editor adds lots of functionality and will be a great feature for Excel users. It doesn’t replace the standard interface, so if you prefer the standard interface you’ll still have access to it. Features will include drag and drop to fill cells, copy and paste columns and rows, duplicate selected content, bulk create and delete rows, browse through cells with arrow keys, and lots more. 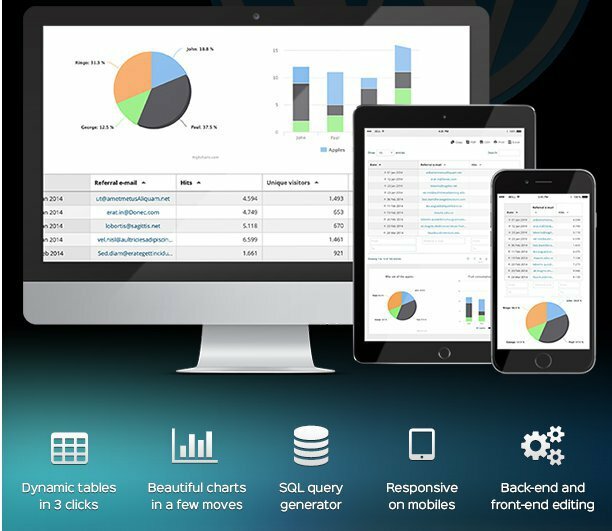 It also includes lots of new formatting features for charts including colors, borders, images, zoom, legends, tool tips, sub titles, exporting image and print view, and lots more. Some of these updates are for HighCharts only. Before taking a look at the new features I created a test table to see how the plugin works. The installation process was painless and I didn’t have to set anything up to start using it. I found the interface to be intuitive but if I wanted to read documentation I could use the link that was prominently displayed at the top of the screen in the wpDataTables menu. At first I had an issue when trying to upload an Excel file. The message just said Error! It didn’t give me any information as to what the problem was so I didn’t know where to start troubleshooting. I saved it as a CSV file and it worked fine. The table displayed perfectly and even gave several options for printing and downloading. One thing that was slightly confusing is many of the new features have to be enabled. Sometimes I would look for a feature to be present only to realize I hadn’t enabled the feature yet. I would rather have them enabled by default so they just work automatically. Once I figured that out it wasn’t a problem to use any feature I wanted. The plugin and its various features are intuitive to use. 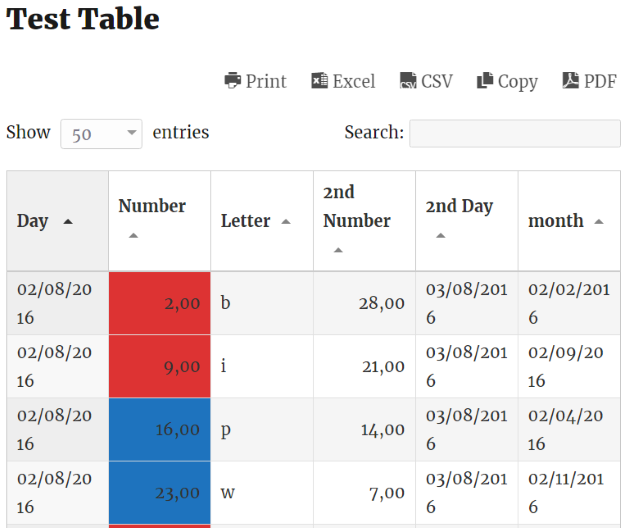 Simply select the types of tables you want, add the data source, and paste in the shortcodes. One of my favorite features was the formulas. Installation was simple and getting started was intuitive. 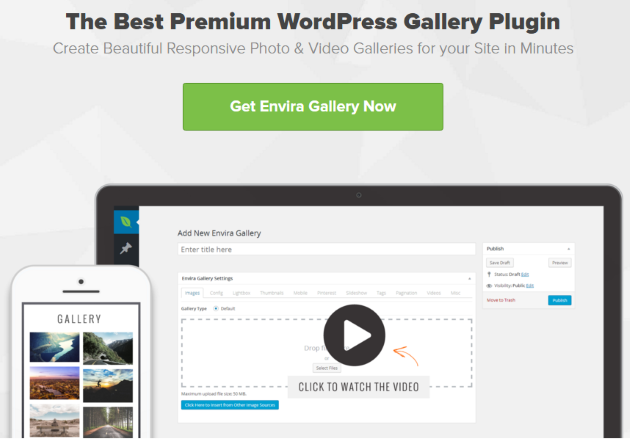 I used it with several themes and plugins, and had no compatibility issues. 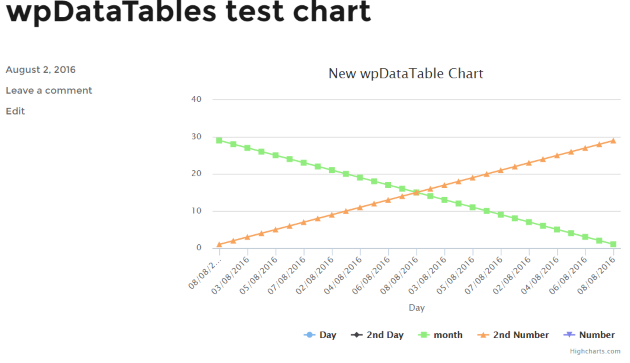 wpDataTables is fully featured and creates tables and charts easily. 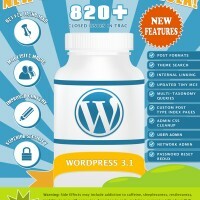 New features that improve the plugin’s usefulness are added often. 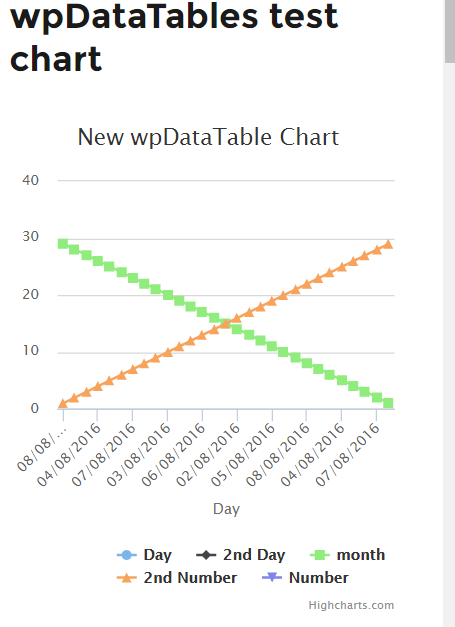 There are a lot of useful features for the $35 price tag, making wpDataTables an easy plugin to recommend for anyone wanting to use tables and charts and manage data within WordPress.